One 2-oz skein of The Red and The Black is plied and it looks gorgeous. Love it. Love it! You know the whole dyeing plan? The one that didn't work as expected? It was my luck. Really. Because if it had gone as planned, I don't think it would look nearly as good. 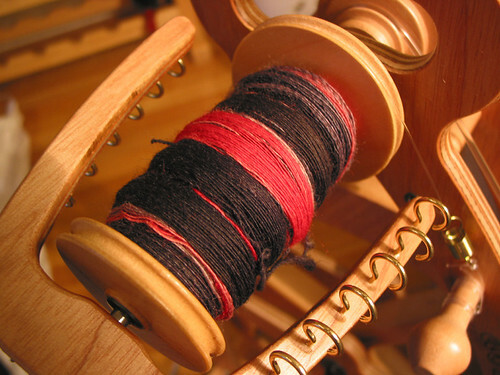 This was my first time navajo plying on the wheel, and while faster than the spindle by a longshot, it was more fiddly. The bobbin wound off more yarn than I could handle and then the yarn feeding from it would twist up and I'd have to stop the wheel to untwist. I think if I had a tensioned lazy kate that would take care of that problem. I found my rhythm, though, and it wasn't too bad. The skein is a little overtwisted, and while the final yarn is not at all rough, I lost some softness with so much twist. It does look sturdy, though, which is good because I intend to make socks. This morning's Knitters Breakfast was fun and overcrowded. They had JCA/Reynolds there this time with sample sweaters and some color cards. There were a couple of cute sweaters, but I can't see myself making any of them. There was not nearly as much free yarn as last time (so I'm sorry if you went on my recommendation and was disappointed), and while they had some pattern booklets, they had no books. They did have some Malabrigo to raffle, and I chuckled because the caller didn't know how to pronounce it. How can you not know? You run what part of this store (and I'm assuming it has to do with the knitting area if you're at the Knitters Breakfast) and you don't know Malabrigo?? I mentioned I never win these things, raffles and the like. Just not lucky that way. Last Knitters Breakfast, there was so much stuff being given away, I thought I had a really good chance to win something. I mean, more than half the people there won something. Maybe even two thirds. Some people had their name called out twice! Anyway, as they're calling out numbers and I'm seeing this huge pile of stuff, I'm thinking, Nah, don't want that one, I hope I don't get it and waste my luck on that one. Ooo, that one, I want that one. Nah, not that one. Definitely not that one. So I'm sending my vibes to lady luck and hoping she hears me and gives me something I want. I got nothing. Was I too picky? Too choosy? Not appreciative enough? This time, they're hiding the pile of stuff behind the table so I don't know how much is left. But I'm taking a different approach to each item. I'm thinking, Hmm, well, I'm not crazy about that yarn but I'll take it. Sure, I'll take that, I'd be okay winning it. I could always trade it. Well, not much of a crocheter but okay, I could win that one too. Yes, yes, pick me. Call out my number! For anything! See? Openness to chance. It is not for me to decide what I will win. I will not send any negative vibes to lady luck! As usual, I didn't win anything. To be honest, I didn't expect to win anything. I hoped. One can always hope. I did walk away with some yarn. Purchased. Half off Adrienne Vitadinni Celia, a 100% silk ribbon yarn, some in brown for a summer shell, and some in white to dye. It's all about the dyeing. 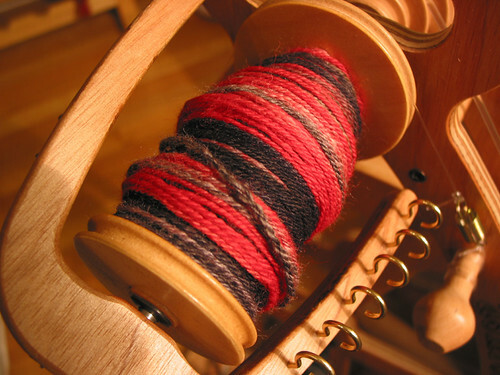 Your spinning is absolutely gorgeous! Great job! 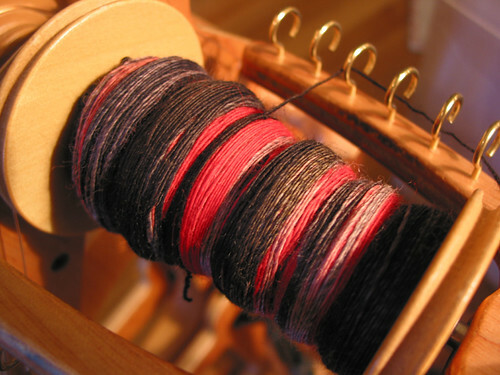 Great looking yarn you spun! As for Fabric Place, I went to the Knitters' Breakfast in Warwick, RI. Last October we had the JCA Reynolds, this time we had the Berocco folks (Audra and Warren). And you are so right, lots of yarn is given away. I won 2 Cornelia Tuttle Hamilton books and my girlfriend won a bag of Classic Elite yarn.